Labradoodles have become widely popular due to their exotic looks, and as “designer” dogs, there is a huge demand for these cute and furry friends. For those who are not sure what Labradoodles are, this canine breed is a cross between a Labrador retriever and a poodle. Knowing the characteristics of the Labrador retriever as a highly energetic hunter and the poodle as a mid-level energy smarty-pants, you are sure that the Labradoodle, which is a mixture of both, will bring with it all the energy, intelligence, and attention-loving personalities of the parent breeds. Feeding your dog properly transcends just providing adequate number of servings per day. There is a need to ensure that your Labradoodle is getting the right amount of nutrients to keep them looking healthy and happy. Yes, dogs can be unselective of what they eat, everything goes down the hatch! However, every dog comes with special nutritional needs in order to maintain the ideal size, weight, and energy level for their breed, as well as to help build immunity to certain health conditions especially at critical ages such as very young pups and the aged Labradoodles. So what is the best dog food for your Labradoodle? A healthy high protein diet made with a blend of nutritious and tasty ingredients is what every dog needs to maintain a healthy lifestyle. 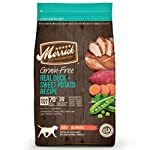 The grain-free meal contains ingredients like real duck and sweet potato as well as essential macronutrients such as protein, Omega 6 and Omega 3 fatty acids which improve skin and coat texture, zero grain and gluten ingredients for enhanced digestibility and glucosamine & chondroitin for the health and development of joints, and hips. This healthy diet contains 70% meat and fish ingredients are a fun meal for your dog and also support great health at all ages. Every serving should be matched with the weight of your dog to ensure that the right amount is being fed to your dog daily. Ensure that your dog isn’t allergic to potatoes. In such conditions, check for other food options. Dogs often need specially formulated meals at various stages in their lives. These differences can be a bit expensive especially when you have more than one dog that are of different ages. 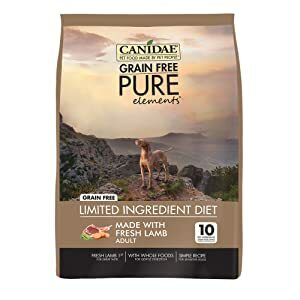 Canidae meals are rich in flavor and come with a general blend of nutritional value that incorporates all the essential minerals and food groups required for great physical health and mental development of your dog at all ages. Its no-gluten, no-grain content ensures easy digestion. It comes in a wide variety of flavors and has essential ingredients with real meat for all protein requirements. The popular American brand is an all time favorite for dogs of all ages. It is rich in protein; it includes chicken, turkey, vegetables, essential vitamins and minerals. A 100% grain free diet with natural flavor and preservatives with a complete holistic balance in nutrient for your dog’s every day need. It is known to greatly increase the appetite of dogs and is always enjoyed by our furry friends. 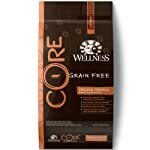 Wellness comes with antioxidants to boost the immune system as well as Omega fatty acids for great coat and skin development; a nutritious treat for your dog. It is rich in protein and fatty acids which is essential for growth and development. Some dogs are allergic to poultry products; ensure that it’s suitable for your dog or check for other options. The nutrient packed 15.5 lb bag comes with real beef, and made especially for adult dog food. It also contains a delightful combination of real spinach, carrots and peas. Its antioxidant properties boost your dog’s immune system and eliminate free radicals. The Beneful brand is quite controversial, being the first brand to use soy as a major source of protein. Its ingredients include chicken, corn, beef, rice, wheat, corn gluten meal. Provides a healthy combination for your dog, with a wide variety of essential macro and micronutrients such as protein, carbohydrates, vitamin K & E, fats and oil, and mineral salts. It comes in a wide variety of flavors and ingredients to give your dog great choices and best tastes. The main down side to Purina Beneful is the controversy surrounding the composition. There have been claims that the diet may not be ideal for dogs due to the presence of menadione which can cause liver problems, allergies, and death from excessive breakdown of red blood cells. Other components are mycotoxin and propylene glycol; these are known to be toxic. 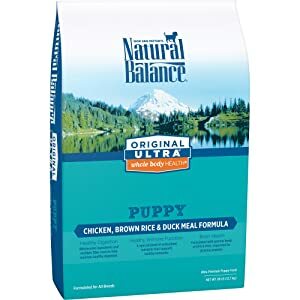 Essentially, this pack of dry, highly nutritious dog meal is made for young Labradoodle pups. This recipe was made while taking into consideration the amount of nutrients required for the growth and development of young puppies. The optimal balance of key nutrients which supports the immune system and mitigates allergies as well as enhancement of vision and strengthening of bones is maintained in every chunk. 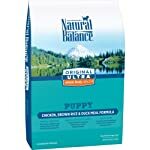 Natural Balance comes in a variety of flavors and is always a good treat for your pup. The health of your Labradoodle depends largely on a number of factors such as exercise, and hygiene with nutrition at the top of the list. Labradoodles have special nutritional needs owing to their huge appetite mainly caused by their high metabolism. These playful, fairly huge dogs can work up quite an appetite on an average day and their exposure to certain health conditions at various stages in their lives makes the quality of feeding very important. 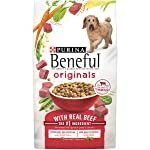 Here are a few food components to look out for when looking to buy the best dog food for your Labradoodle. Most dogs often present with gastrointestinal tract problems as they grow older and this leads to poor digestion. When these conditions occur it becomes difficult for the dog to digest meals effectively leading to being overweight and lots of other health issues. A proper dog meal should be free of grains, gluten and other food elements that may be difficult to digest. The presence of a probiotic would ensure that digestibility is greatly improved as well as immunity to certain infections and diseases. The amount of calories that your Labradoodle requires daily is largely dependent on lifestyle. Some dogs are more active than others. The level of activity of hybrids also depends on the character and personalities of the parent breed. The required calorie intake also depends on the weight of your dog, this is to ensure that your dog does not become overweight and begin to develop joint issues due to the excess weight. A Labradoodle weighing 60 pounds may be fed an average of 1313kcal meal per day. A young, hyperactive, and virile Labradoodle that leads an active life style may require a bit more fuel to get by, in this case a 2088 kcal per day can suffice, and however, older dogs that engage in less physical activities may thrive better with fewer calories in their meals in order to keep body mass in check. Labradoodles are a very sensitive breed of designer dogs and require a balanced nutrition comprising of all the necessary macro and micronutrients. Protein is a most necessary meal component as well as fatty acids to ensure the healthy development of their skin and fur coat. Adequate levels of vitamins and minerals act as antioxidants in the system to boost your dog’s immunity against certain illnesses and diseases that may be peculiar to the breed. Sufficient levels of nutrients such as glucosamine and chondroitin are most essential to mitigate hips and joint related diseases that may occur at a later stage in the life of the hybrid. Labradoodles are easy to spot with their distinctive curly coat and their free-spirited hyperactivity. They are a mix between Labrador retrievers and poodles. The designer breed is a perfect family dog, though categorized as high maintenance due to its abundance of fur which sheds seasonally, needing lots of grooming and trimming quite often. Labradoodles can weigh 15 to 100 pounds with a varying size between 14 to 24 inches. This high energy hybrid has an average lifespan of 10-15 years depending on genetics, lifestyle, hygiene, nutrition and other conditions. Labradoodles make great home pets and are recommended for kids of all ages due to its friendly and playful personality. The hybrid is often vulnerable to allergies from sensitivity to various food types. Grains are an ultimate cause of allergies in labradoodles, grains such as corn, soy, wheat and the likes are a no-no. In the event of a food related allergy you can change your dog’s diet to strictly limited ingredient and diets rich in animal fats. 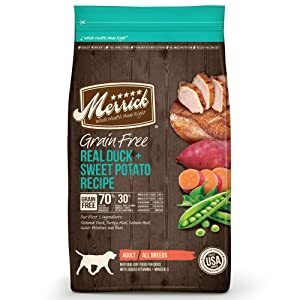 There are many brands of dog food in the market, that are quite suitable for Labradoodles and absolutely nutritious however, if you are considering taking on one particular brand and making it your personal favorite we would recommend the Merrick Grain Free Real Duck Sweet Potato Recipe as this dog food brand is masterfully made, 100% nutritional value, best digestibility, improves your dogs health and keeps allergies at a distance. 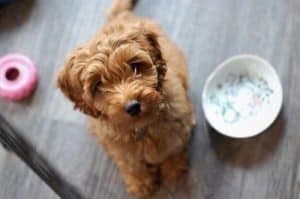 Quality nutrition plays a key role in the life and health of a dog and Labradoodles, being case sensitive in terms of food selectiveness require specific elements in their daily feeding in order to maintain optimum health conditions.